In the wake of a surge of reports on the extent of global warming, current disasters attributable to climate change, and dire predictions of a warmer future, many global companies, and state and local governments are taking initiatives that surpass the snail's pace policymaking of national governments. The smart companies that understand that a hotter climate is not good for business are not waiting for government carbon limits. They are taking immediate action within their own operations to reduce the release of carbon. This is the new way to establish a "green" corporate image. The first companies that take carbon reduction initiatives will be far ahead of their competitors who do not, as consumers become acutely aware of climate change. Other companies are calling on their national government to set carbon limits that far exceed Kyoto reductions, to establish equal conditions for all industry. Google, Pacific Gas & Electric, and other companies have pledged to cut their greenhouse gas emissions and help make the San Francisco Bay Area a leader in fighting global warming. Pacific Gas & Electric currently produces 30 percent of the energy it provides to California users from renewable resources. More than two dozen companies joined the Business Council on Climate Change, a coalition of San Francisco Bay Area businesses that promise to report and reduce carbon emissions, share the best green practices and advocate for policies to address global warming. The BC3 coalition was launched at San Francisco City Hall at an event aimed at encouraging more businesses to join. The initiative is being organized by the Bay Area Council, city of San Francisco and U.N. Global Compact, which plans to promote the business-led initiative as a model for other cities and businesses worldwide. In September 2006, California became the first state in the United States to impose a cap on global warming emissions. The Global Warming Solutions Act requires the state to adopt a limit on greenhouse gas emissions equal to 1990 levels by 2020. A group of Fortune 500 executives including Chad Halliday, CEO of Dupont, Peter Darbee of Pacific Gas & Electric, and Steve Elbert of BP America joined Jonathan Lash of the evironmental group World Resources Institute, to testify before the Senate Environment and Public Works Committee to push for a mandatory federal cap on greenhouse-gas emissions. "Voluntary efforts alone will not solve the problem," Chad Holliday told the assembled senators. "We see a whole suite of technologies to solve these problems, and we think the uncertainty of what regulations will do are holding companies back", he said. Their testimony impressed one Republican, Virginia Senator John Warner, who is a potential swing vote on climate legislation. Senator Warner made the comment "A group like this, you've got my attention." Ten major corporations are founding members in the United States Climate Action Partnership. They are Alcoa, BP America, Caterpillar Inc, Duke Energy, DuPont, FPL Group, General Electric, Lehman Bros, PG&E Corporation, and PNM Resources. The US-Cap founding members also include four environmental organisations, Environmental Defense, Natural Rsources Defense Council, Pew Center on Global Climate Change, and World Resources Institute. The coalition is pushing for limits on greenhouse-gas reductions that will slash emissions 60 to 80 percent by mid-century. "The undertaking to address climate change is an enormous one and should not be underestimated ... enacting environmentally effective, economically sustainable and fair climate change law must be a national priority" said Jonathan Lash. USCAP says the scale of the undertaking to address climate change is enormous, and should not be underestimated. The way energy is produced and used must fundamentally change, both nationally and globally. The climate change challenge will create more economic opportunities than risks, but will require innovation and products that drive increased energy efficiency, creating new markets. The coalition foresees innovation leading directly to increased U.S. competitiveness, as well as reduced reliance on energy from foreign sources, causing increased energy security and an improved balance of trade. Incentives to encourage actions by other countries, including large emitting economies in the developing world, to implement greenhouse gas emission reduction strategies. 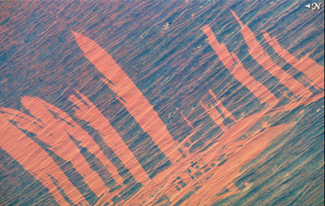 Images from space of fire scars in the Simpson Desert near Alice Springs, Australia. Image ISS Crew Earth Observations and Image Science & Analysis Group, Johnson Space Center, NASA. Companies and organizations from around the world who are members of the Global Roundtable on Climate Change (GROCC) have endorsed a bold post-Kyoto framework for affecting change at the levels of policy and industry, particularly in regard to creating sustainable energy systems necessary for achieving economic growth. The companies that have endorsed The Path to Climate Sustainability: A Joint Statement by the Global Roundtable on Climate Change are from a range of sectors and industries, including air transport, energy, technology, insurance, and banking. The statement endorsed by Allianz, Bayer, Citigroup, DuPont, General Electric, Volvo, and many others, calls on governments to set scientifically informed targets for greenhouse gases and CO2 emissions. Governments are urged to put a price on carbon emissions and to set policies aimed at addressing energy efficiency and de-carbonization in all sectors. Climate change is "an urgent problem" requiring global action to mitigate risks and impacts while also meeting the need for energy, economic growth and sustainable development. It outlines cost-effective technologies that exist today and others that could be developed and deployed to improve energy efficiency and help reduce CO2 emissions and other greenhouse gases in major sectors of the global economy. The statement has received endorsements from critical stakeholders and independent experts including leading corporations from all economic sectors; smaller firms with different perspectives and concerns; an array of civil, religious, environmental, research and educational institutions; and a distinguished list of world-leading experts from the fields of climate science, engineering, economics and policy studies. The signatories include Air France, Alcoa, Allianz, American Electric Power, Bayer, China Renewable Energy Industry Association, Citigroup, DuPont, Electricity Generating Authority of Thailand, ENDESA, Eni, Eskom, FPL Group, General Electric, Iberdrola, ING, Interface, Marsh & McLennan Companies, Munich Re, NRG Energy, Patagonia, Ricoh, Rolls Royce, Stora Enso North America, Suntech Power, Swiss Re, Vattenfall, Volvo, World Council of Churches, World Petroleum Council, and many others. "Global businesses are assuming their just place as catalysts for action on climate change. But action by business alone is not enough," said Jeffrey Immelt, Chairman of General Electric. "While we believe that applying technology against problems will create positive business opportunities that can result in positive change, national, state and local governments, academia and other non-governmental organizations must step forward with equal force" said Immelt. Clement Booth, Executive Board Member of Allianz SE, a global leader in insurance, banking and asset management said "Allianz is seeing signs that climate change is a serious emerging risk, and we expect it to remain a top-tier issue for the insurance industry for many decades. I believe it is our responsibility to address and tackle this risk." Provide incentives to reduce emissions from deforestation and harmful land management practices. Emphasis is placed on taking proactive advantage of existing technologies and accelerating promising development of new ones in order to significantly increase energy efficiency, dramatically expand the use of non-fossil fuel energy sources, and greatly reduce emissions from the fossil fuels likely to remain in use. Companies themselves pledge to take action in their own operations as well, from seeking reductions of their own emissions to working to increase public and industry understanding of both the risks of climate change and potential solutions. "Of course, addressing climate change involves risks and costs. But much greater is the risk of failing to act," said Alain Belda, Chairman and CEO of Alcoa, the world's leading producer of aluminum.